24 February 2012, a spectacular event was hosted on behalf of Cafe Arom to experience art through all your senses! The event took place at Sevenoaks Trading’s warehouse. 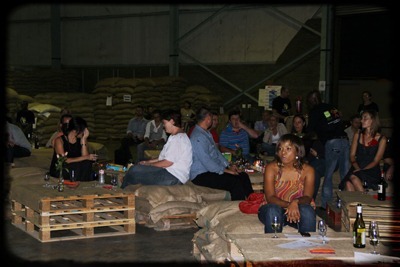 Walking into the warehouse the guests’ senses were stimulated with the smell, the feel and the look of coffee, using coffee bean bags as chairs and coffee pallets as tables covered with hessian bags as table cloths. The fire braziers and lanterns created a warm cosy atmosphere and the mingling and chatter of guests made this an evening to remember. Nic Dinnie Trio Jazz band, played subtle jazz music in the background. Carol Lane from Sevenoaks Trading opened the evening, welcoming everyone and took the guests on a visual tour of coffee from soil to cup. 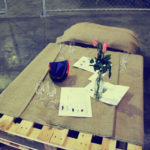 Then the time arrived for the guests’ to develop their coffee pallets. Favourable tastings, which represents some characteristics that can be found in coffee, were served. Each tasting represented a different roasted coffee and Izelle Fourie from Sevenoaks Trading’s explained to the guests what to be aware of when tasting these different coffees. Melanie Botha from Cafe Arom, introduced her team, and was also excited to start this evening by handing out one of Cafe Arom’s coffee blends to all the guests. Dieter Marzinger was most inspirational! After a terrible accident, he became a paraplegic. With true dedication, self-discipline and inner strength, he taught himself the art of mouth painting. His art was a feast for the eye! Martin Prinsloo from Liquid Tastings, then introduced the guests to the art of wine tasting the connoisseur way. After all the speeches, presentations, and demonstrations, the time had come for the guests to relax and enjoy the evening, whilst cupping three origin coffees, drinking wine and buying paintings. What a magical evening CELEBRATING the art of tasting, smelling seeing, hearing and feeling!